The Health Informatics team aims to improve healthcare quality via advanced mobile health (mHealth) and data mining technologies. 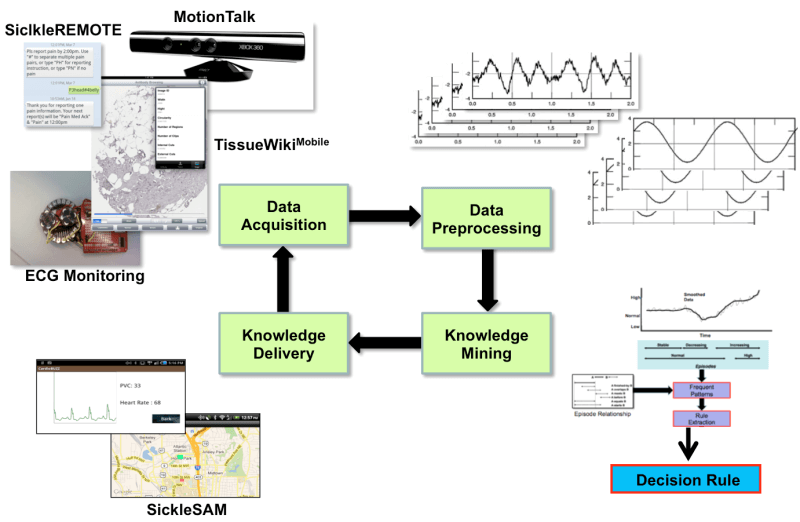 Mobile Health and Health Informatics research in the Bio-MIBLab focuses on four data modules: Acquisition, Preprocessing, Mining, and Delivery. Data Acquisition relies on patient-oriented health data collection technologies including 1) text messaging for chronic self-reporting, 2) body sensors for real-time abnormality monitoring, 3) mobile imaging interfaces for pathological knowledge sharing, 4) motion sensors for home-based rehabilitation, and 5) social networking for health behavior education. Data Preprocessing recognizes specific patterns of interest from collected data and identifies outliers and unusual states that are clinically important, while ignoring uninteresting noise such as measurement error. This step also requires recovery missing values so as to maintain a certain level of data integrity. Given the qualitative information from the Preprocessing module, the Mining module can potentially detect previously unknown health conditions and events. These may be novel patient phenotypes or useful information about the final care delivery processes. Methods used in knowledge mining include classification, clustering, and rule association learning. The mined knowledge is finally delivered via the Delivery module. We develop web-based tools on a cloud server. Mobile apps on Android, iPhone, and iPad are also provided for patients and professionals for seamless communication and data access. Our work represents a collaboration of several well-established medical centers and research groups from the metro-Atlanta area, including Children’s Healthcare of Atlanta (CHOA), Shepherd Center, and Georgia State University. We have focused on sickle cell disease, cardiac conditions, acquired and traumatic brain injury, and pediatric psychological therapy.